"My photos are good, and I keep getting better, but I can't seem to find enough clients to keep my business going..."
"In my area there's too much competition, I have to keep my prices low otherwise I'll lose all my clients..."
"I don't know how to price my products or the best way to present my offers, I see what others are doing and it's all very confusing..."
"I don't even know if my photos are good enough to charge what I would like to charge... I feel I'm not quite there yet..."
"Everybody wants digitals... how can I sell anything else!" Digital photography may have opened the door to many of us to follow our passion, but at the same times it's created a series of challenges that simply were not there in the age of film. And if you're experiencing any of the the situations described above... rest assured that you're not alone! Whether you're starting up in business, or have been running it for years (or trying to find a way to leave your job and get it going! ), there's always a time when you feel stuck on some things and can't quite break through to the next level. Maybe figuring out the best way to do your pricing, or set up your workflow. Or just knowing what to do next in order to be most effective and not waste time. TWO DAYS of deep, intensive coaching on every aspect of the photography business, starting at whichever level you are right now. You're a good pghotographer, but you haven't got clients and you don't know why! And maybe you've attended lots of workshops, bought online courses, and joined endless facebook groups, only to find conflicting information because everyone seems to be doing it differently... and in the end most of that doesn't work for you. Outside the Box is for driven, ambitious photographers who are ready to grow their business,get out of the competition rat-race and make a mark in this world through their skills, talents and passion. We need to invest in ourselves if we want our business to thrive, and reach the goals we set in the shortest time and with the least amount of effort (and failures). You don't have to re-invent the wheel every time! 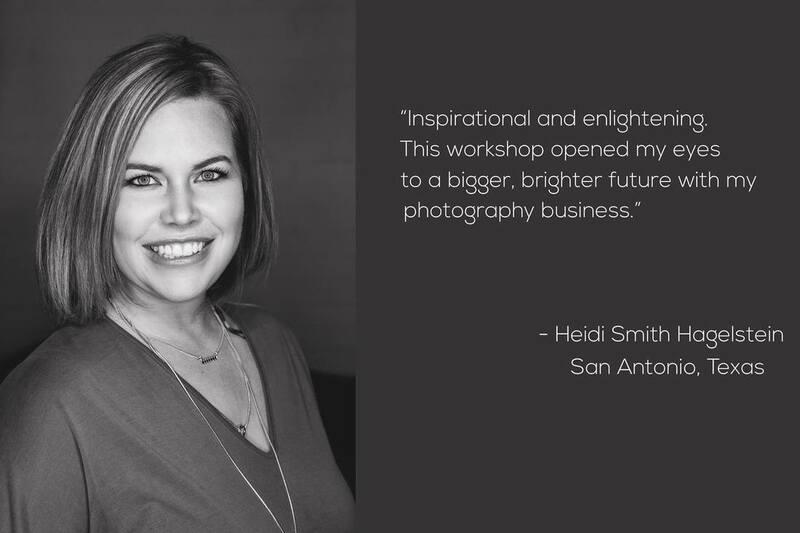 This workshop is a full, intensive, 2-day experience specifically dedicated to portrait and wedding photographers. 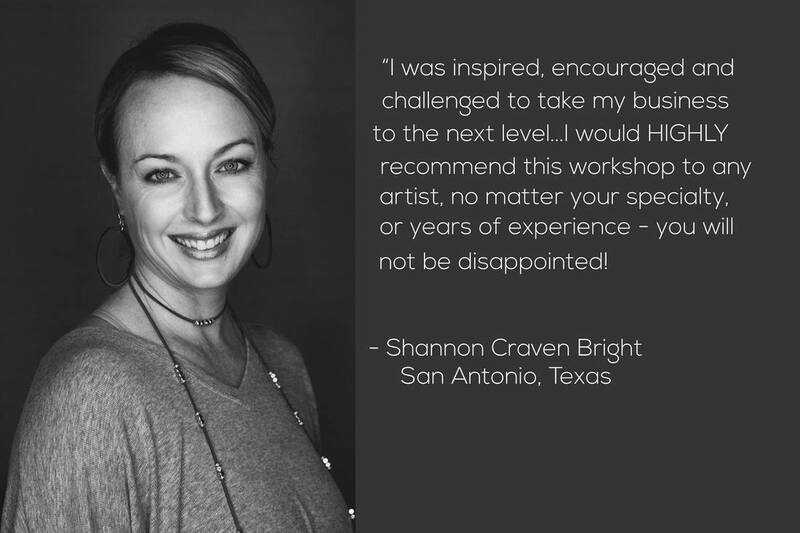 Are you ready to take a leap forward in your business? Welcome aboard! I'm a portrait and wedding photographer, and I help photographers raise the level of their work and increase their business (and their earnings). My work is all about deep shifts in perspective, seeing things with new eyes, and thinking outside the box. Doing things differently from anyone else, and communicating that effectively, comes from looking deeply at ourselves and making changes as we grow to bring our business to where we want it. I like to keep things simple. But very effective. The OTB Workshop is extremely practical and filled with ideas and strategies that you can put into practice straightaway. (and it's also designed to help you make money immediately, which really doesn't hurt). Why family and personal portraits are important and how to comunicate it to our clients. Developing your confidence and discovering your uniqueness to step out of the competition and attract your perfect clients. Making sure your clients rave about you even before they see their images (and are ready to buy a lot when they do). And printing quality, as well as its direct influence on our income. Calculating costs, defining goals, and how to get there. Differences in communication, marketing and sales. Communicating with clients to work better and increase sales. Managing emails, phone calls, and price enquiries. and how to manage it in detail. Making a strategic price list to never leave money on the table again. Why a premium offer raises the value of all the others. Simple and organic ways to book shoots all year round. Taking IPS to a whole new level, with or without a studio. How to be at ease when we talk about money. How to find the right partners for your business, and boost sales for both. How to sell and expand in a market that (almost) doesn't exist. How to make a detailed plan to reach the right clients for you. How taking one step at the right time can radically change your life and your business. Intelligent planning and goal setting to finally run your business from a place of freedom and joy. The pitfalls we all encounter on the road to success. How to recognize them, deal with them, and learn to use them to our advantage. Getting into the right mindset to achieve the results you’re aiming for and more! WHOA! THAT'S A LOT OF STUFF! Yes, it is! This workshop is for professionals who are committed to raise the level of their work and increase their income this year. It's intensive and deeply engaging, but we're also going to have some fun! 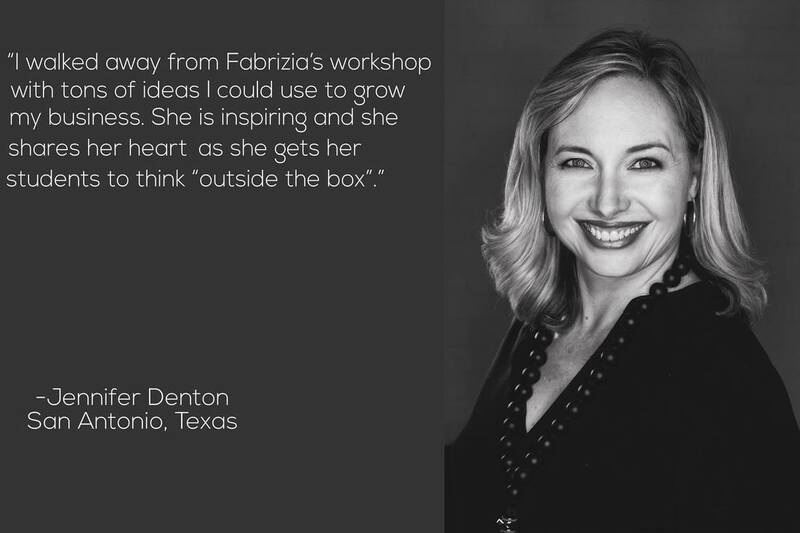 Fabrizia has changed my life and business. I didn’t know where I was a year ago, the only thing I knew was that I love photography. I had bad prices and a bad system. She extremely patiently explained to me each step to take to be successful and happy and I cannot imagine now how I could I do it any different before. Her knowledge and experience is beyond any book and course and I love that I can talk to her about anything and she switches straight away into my shoes, giving great advice. The best investment you can make to get your business where you want it is to invest in YOURSELF. When you grow, everything grows. When you change, everything changes. Are you ready to create your own work, and your own life, just as you want it? If your answer is a resounding YES, you're in the right place!